MAJOR INCENTIVE!! SIGN A ONE YEAR LEASE AND RECIEVE FREE CABLE AND INTERNET FOR ONE YEAR!!!! Nestled in the convenient Oliver neighbourhood, just one block off Jasper Avenue, this building is sure to impress! Enjoy walking distance to Save-on-Foods and various restaurants, cafes and retail stores, and not to mention Corona LRT station, Macewan University and more!! The second you enter this building you feel the luxury! 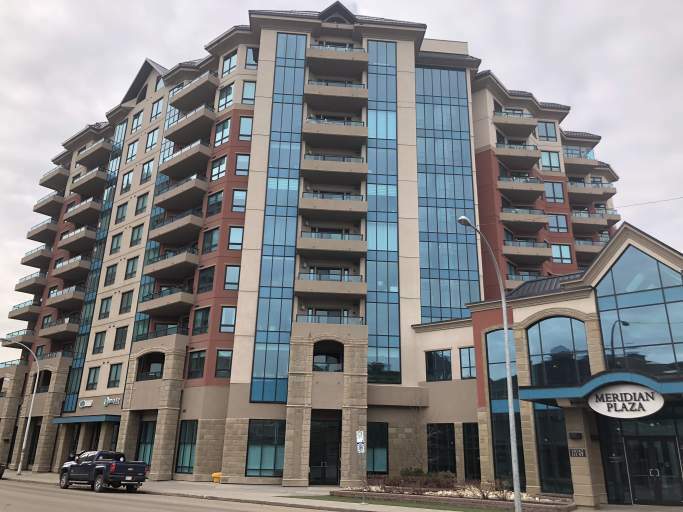 With everything from beautiful views, to underground parking, to a stunning front entry lobby, this building has it all! The units itself boasts gorgeous hardwood flooring, modern finishing and tons of natural light! The large living room offers a gas fireplace and access to a large balcony through sliding glass doors, you'll love the view this balcony offers! Off the kitchen is a small dining area, along with a modern kitchen with light cabinetry, stylish stone backsplash, stainless steel appliances and a large island with extra counter and cupboard space! Off the living area is a full bathroom with tub shower, and a large bedroom which features large windows, carpet flooring and a large closet. A small laundry closet with stacked front loading laundry machines finishes off this bright unit. Only Pay Power – Heat and Water Included in Rent! Plus, One Underground Parking Stall Included! !